Details at the end of this post on how to win an ebook copy of this book and links to purchase it, and a chance to win an audible copy of another of Judy's books-The Hanged Man’s Noose. Judy Penz Sheluk’s fans got their first look at her Glass Dolphin Mystery series in July 2015 with The Hanged Man’s Noose. She opened up her engaging series from the perspective of Emily Garland as a freelance writer whose assignment has her relocating to Lount’s Landing and acting as the editor-in-charge of a local magazine and covertly investigating a real estate developer with rumors swirling around about questionable, if not criminal, connections. But, Karma lurks when real estate shenanigans turn murder, and Emily is on the front lines. This year in A Hole in One, fans find Emily deciding to remain in Lount’s Landing, but Arabella’s perspective becomes more important when mayhem strikes close to her heart. A Hole in One earns 5/5 Murderous Back Swings…Clever and Fun! Just when you thought you had it all worked out… Judy Penz Sheluk has penned an excellent follow up to her first Glass Dolphin Mystery with entertaining twists and turns, and although you can start here, I highly recommend you not forget The Hanged Man’s Noose including the audio format which is enriched by the talented narrator Suzanne T. Fortin. As a beginning or as a prequel, it is excellent, too. In A Hole in One, Emily and Arabella once again join together to solve a well-crafted mystery riddled with secrets, lies, and conspiracies. Each chapter added another layer to the mystery or revealed another clue, another possible suspect, or just provided an entertaining “Wow” moment. It wasn't easy to pause. Her characters are engaging, not relying on stereotypes, with realistic strengths and weaknesses that go beyond the common cozy mystery genre. There are admirable characters to a few snarky ones you only hope get a bite from karma. Arabella takes the lead in this story trying to clear her ex’s name, but we are also treated to her knowledge of antiques sending me to google images. It is an all-round delightful book! A Hole in One is an excellent read in which I am so lucky to have had a small part. As a beta reader, I got a fascinating first hand look at the writing and publishing process, and enjoyed the connection fostered. Thank you, Judy, for the mention in the acknowledgements…so much fun to see my name in print! My first introduction to Judy Penz Sheluk’s work was reading and reviewing the clever engaging first book in her Marketville Mystery Skeletons in the Attic. After which I was lucky to have struck up an e-friendship accepting a role as beta reader for the second book in this series. The working title is Past and Present, and all I can say is…you won't want to miss this, including “Kat Fowler,” my maiden name, that pops up as a very minor character. Excellent! Don't miss out Judy’s collections of short stories: Live and Let Tri (January 2016), a collection of three short mystery stories in all formats including audio with the voice taken of narrator Kate Tyler; Unhappy Ending (February 2016) a collection of three flash fiction stories. She is also included in two multi-author collections with Toronto’s Sisters in Crime: The Whole She Bang II (November 2014), The Whole She Bang III (November 2016). All are well-worth reading! What got you into golf? My husband, Mike, was a golfer. When we moved to Holland Landing, there was a golf course a couple of miles away. I was lamenting one night about not having any friends in the area (at the time, I was commuting to Toronto to work, about an hour’s drive each way). He suggested I take up golf, and so I joined the ladies league at Silver Lakes Golf & Country Club (I actually credit Silver Lakes in the acknowledgments of A Hole in One). Mike was right. I’ve made lifelong friends through golf. When we moved to a new town three years ago, the first thing I did was join two ladies leagues. You’re not going to become best friends with everyone you play with, but you’ll find camaraderie and companionship. And since I walk vs. take a cart, it’s a bit of exercise, too. How did golf influence you? I’ve been golfing for the better part of fifteen years, might even be twenty by now. While I’ve never had a hole in one (hope springs eternal), I’m always dreaming up new plot lines…even when I’m golfing. One day my ball landed in the woods, and while I was rooting around for it with my putter (fearing poison ivy), I thought, “What if there was a dead body in here?” What can I say? My husband tells me he’s taken to sleeping with his eyes open! Is there a course that you'd consider a favorite or one you've conquered? Ha! Conquered. That would be nice. I’ve played less than a dozen different golf courses over the years, so I’m no expert, but I’ll always have a soft spot for Silver Lakes, even though I seldom get there now that I’ve moved. It is a beautiful course. What golf course is on your “bucket list”? I’m not good enough (or rich enough) to play somewhere like Pebble Beach. Golf can be a humbling game, but it can stop being fun if you’re playing at a course well beyond your capabilities. I’m all about having fun, first and foremost. But if I had to pick, I’d say any course along the ocean in Hawaii, because then I’d be in Hawaii! 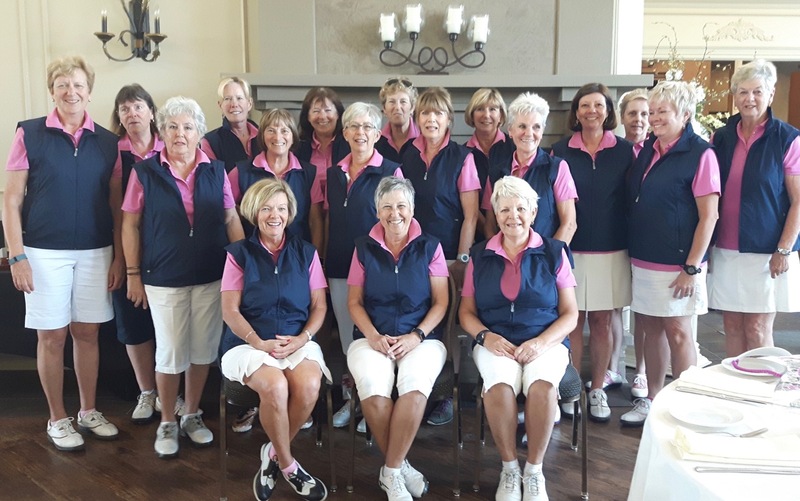 Enjoy Judy’s blog on Golf Lingo. To enter to win an ebook copy of A Hole in One, or an audible copy of another of Judy's books-The Hanged Man’s Noose- simply email KRL at krlcontests@gmail[dot]com by replacing the [dot] with a period, and with the subject line “hole,” or comment on this article. A winner will be chosen April 28, 2018. U.S. residents only. If entering via comment please be sure to include your email address. BE SURE TO NOTE WHICH BOOK YOU WANT. What a fabulous review, and I loved your interview questions. Thank you! 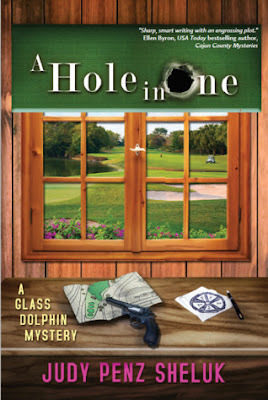 I would love to win an ebook copy of A Hole in One. Thanks for the chance at the giveaway. Thank you for the introduction to Judy Penz Sheluk's books. Great review and interview. I'd love to win an ebook copy of A Hole in One. This sounds really good--I'd love to read it! I would love to win an audible copy of the author’s book. I don’t play golf but enjoy watching others play. Great interview. Thanks to all for commenting! I'm so pleased to have Kathleen's support! Good luck to all.